Sonny Rollins (ts) Ray Brown (b) Shelly Manne (d) recorded Los Angeles, CA, March 7, 1957, engineer Roy duNann, produced by Lester Koenig. Selections: Rollins delighted in cheesy material as his start point (think of No Business Like Show Business on the LP Work Time – who else but Sonny would dare?) After the scene-setting clip-clop intro, Sonny articulates the quirky lyrics of composer Johnny Mercer, and then he’s off on his signature seamless runs and biting accents over Brown’s solid underpinning framework. In contrast, Rollins is luxuriously expansive on Duke Ellington’s Solitude, a classy big-toned ballad with ample scope to explore the melody, which is never far away. Rollins’ Chronology: Work Time (1955);Tenor Madness (1956); Saxophone Colossus (1956);Tour De Force (1956); Tribute to Bird (1956); Sonny Rollins, Vol. 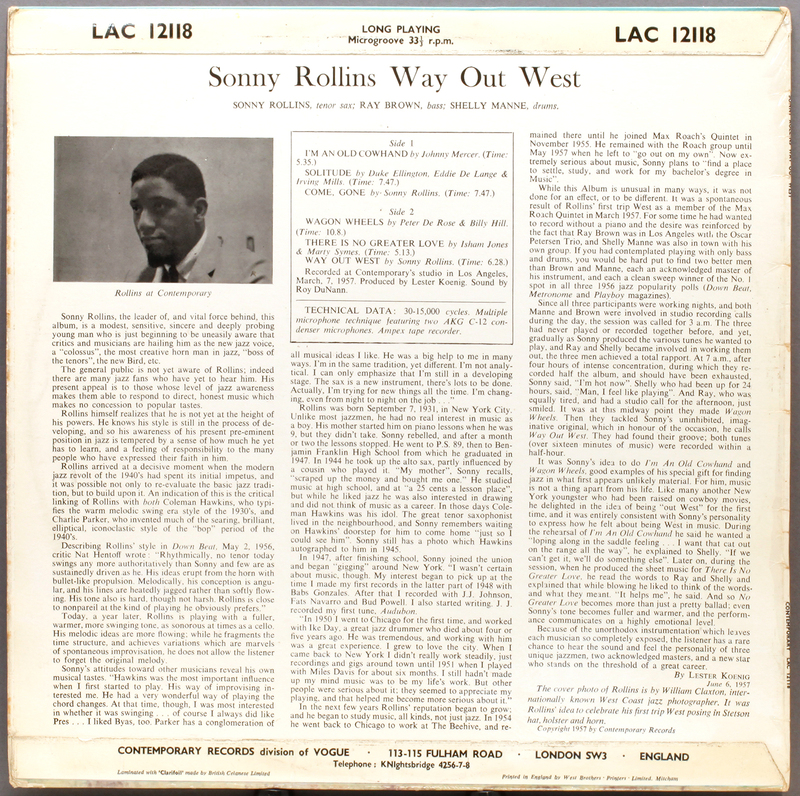 1 (1956); Way Out West (1957); Sonny Rollins, Vol. 2 (1957); The Sound Of Sonny (1957); Newk’s Time (1957). Downbeat Poll-winners Ray Brown and Shelly Manne find themselves on their first outing, “strolling” with Rollins in a piano-less trio format in which Sonny solo’s over bass and drums. Though the rhythm section are rewarded with their solo spaces, there is no post-bop emancipation of the supporting players to equal roles. No one is in any doubt, this is Sonny’s album. The trio play with a relaxed mastery, humour and endlessly inventive interplay. It is also a fine recording by duNann, equipped with two of the relatively new German AKG C12 mics, which duNann would whack straight into his Ampex tape recorder ( so I am told, hat tip Marc) made possible because the C12 already contain a valve amplifier within the body of the mic, intimately capturing the presence of the instruments. Just another reason why analogue vinyl audio reigns supreme. Vinyl: Contemporary Vogue LAC 12118 UK 1st release, mono, pressing by Decca 146gm vinyl. Song copyright on the label refer to French licensees, though this is unequivocally a UK Decca pressing, perhaps a quirk of planned European distribution. 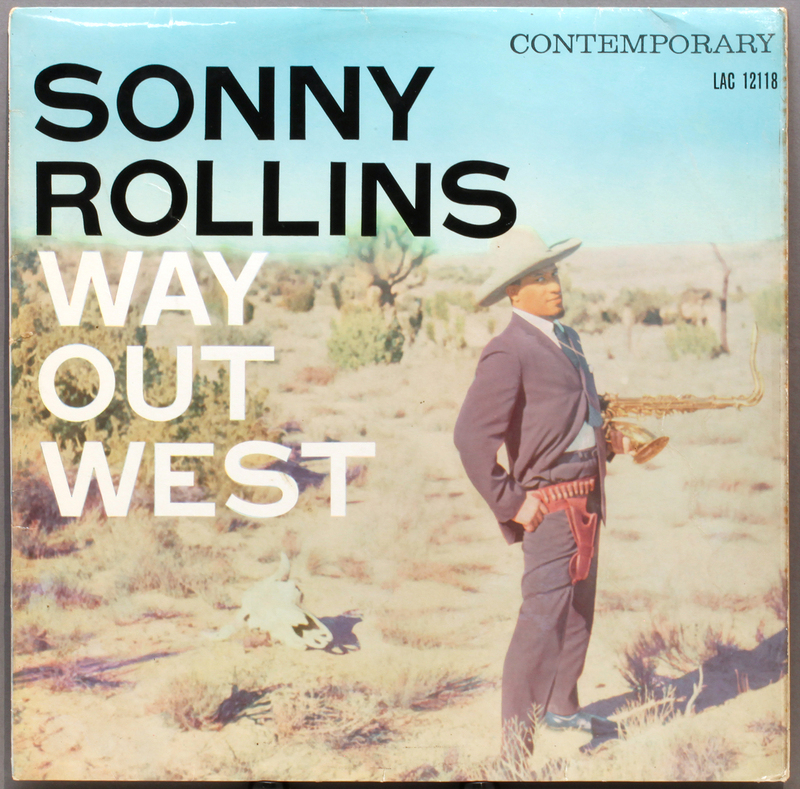 Cover: The idea for the cover photograph, Rollins dressed in Stetson hat, holster, and horn in place of a pistol, was apparently Rollins’ own, to celebrate his first trip out West, according to Koenig’s liner notes. Straight out of 1957, time out of joint, the cowboy genre was part of the staple diet of the 50’s small screen, and Rollins approach is a little tongue in cheek, as an unlikely afro-American cowboy. It’s a long time culturally before Mel Brooks’ Blazing Saddles. Source: Collection of the late Brian Clark, who had a fondness for Rollins, and you can expect more Rollins from his collection in coming months. This entry was posted in Contemporary, Sonny Rollins and tagged Contemporary, Ray Brown, Roy DuNann, Shelly Manne, Sonny Rollins by LondonJazzCollector. Bookmark the permalink. Thanks Andy; yet another superb selection; what can I say?. Way Out West would not be my first choice among the Rollins albums (it would probably be Sonny Rollins plus 4, followed by Sax Colossus, and perhaps tying with The Bridge for the #3 spot), but it would definitely be in the top five. I love the way the small combo works. Very sparse, uncluttered, earthy. All emphasis is on sax, and Rollins simply burns here. I am missing a piano, though. Tommy Flannagan would have been a great addition to the proceedings. I could not find anything about this online or off. Does anyone have any idea or information on this? In my humble view, Way Out West is a quintessential mono listening. Original (and reissue) US stereo pressings should be avoided, although – as these things go – they are nowhere near as bad as some of the other stereo or “stereo” pressings from the era. I’ve never seen any others — and neither of these strike me as exceptionally phallic, but what do I know. Hi Jim – Marc Myers, he’s the man who knows all. As for phallic symbols, I prefer cymbals, the rest, seek and ye shall find. Shaft: I like your description of DuNann, “he can be very dry”. He sure can, the way he recorded Shelley is a perfect example. Never heard a drier drums sound than the one on Way Out West. If Shelley in the readers’ polls of the fifties was overestimated (Jim Crow? ), at present he is definitely underestimated (Crow Jim?). Thanks Mastering guru Steve Hoffman wrote a lot of stuff about that when he searched for the original masters 😉 Speaking of dry: Hoffman put out on the Nat Cole DCC disc an extra bonus track with the song Stardust. On this he took it straight from the master before Capitol put those famous echo chambers on.The track sounds fabulous, super dry and Nat IS IN THE ROOM! Right now I’m listening to Shelly Manne’s “The Gambit”, stereo, 1957. Sound by Roy DuNann. And what a marvellous sound it is! No one else could even approximate it, not in 1957. “He can be very dry”? I don’t know, all I know is that the drum set and bass in particular are captured in the most perfect way. None of the boom-booming and absence of bass notes that plagues so many famous Blue Note dates even into the early 1960’s. It’s a decent bass sound created by a man who was not afraid of (purportedly) putting a strain on contemporary lo-fi home equipment, rather than adapting to it. From my own experience back in the 60’s I know that DuNann’s recordings always sounded exceptional, even on cheap gear. One thing about DuNann: rather than routing channels through a reverb unit during recording, he often used a tray reverb unit between the tape machine and the cutting lathe. As a result of this, later remasters of his recording often sound inexplicably dry, since DuNann famously did most of his recording in a back storage room at the Contemporary offices. I found this out the hard way after purchasing a 60s remaster of “Sonny Rollins and the Contemporary Leaders”. Your pressing seems to have ample reverb. I wonder whether it is on the tape or if it was added by the Decca cutting engineer (1B in the matrix indicates Ron Mason). I would think any Decca engineer would sooner run out into oncoming traffic than hook a reverb unit to a lathe, so my guess is the former. Fascinating question, which I have no idea how to answer, since I know there is something called a “reverb plate” but have no idea why or how it is used. Any of your fund of links help? If that’s true, a Decca engineer would indeed have to have added the reverb in the process of cutting the master your LP was pressed from. Alternately, a 2nd generation tape could have been created with reverb and shipped to Decca. RVG used a spring reverb unit up until about 1955 or so (it would be interesting to figure out the actual date he stopped using it). You can hear it on “Walkin'”, for example. To me it, sounds a bit like a slinky. Spring reverb also makes a nasty noise something like a fluorescent bulb when there is a sudden, loud peak. This was particularly bad in the early days of recording when there were frequent pops in equipment caused by current arcing. You can hear this nasty combination occasionally on Charlie Parker’s first Savoy session, for example. I believe after that RVG replaced the spring reverb with a reverb chamber of some sort at his Hackensack studio, but I don’t think there’s any specific information about that. I believe that he used a microphone at the top of the ceiling in his Englewood Cliffs studio to add ‘room sound’ once he relocated. I seem to even recall seeing one in a photo. I remember reading something about the “natural echo” in the Englewood Cliffs studio being a hallway connected to the living room. Very natural sounding imo. Van Gelder did most of his “tricks” when recording and in the recording setup + some more tricks when cutting the LP masters – but I don’t think Rudy added a lot of echo and EQ’d his sound so much. I like them both but DuNann is more Hifi for sure. Felix, what is a “tray reverb” unit?